Left to right: Alvin, Edwin, William and Yale Whitney. Home of the Soul is a gospel song recorded by the Whitney Brothers Quartet from September 7 to September 9, 1909 at the Victor studio in Camden, New Jersey and released on Victor (16372). 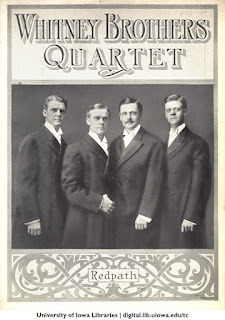 Between October 1908 and September 1909, the Whitney Brothers Quartet recorded 25 songs for Victor. 1908 - Smiling Morn, The Cheerful Wanderer, Sally In Our Alley, Excelior and The Little Red Drum. 1909 - How Can I Leave Thee?, Santa Lucia, Forsaken, Love's Old Sweet Song, The Hunter's Song, The Bluebells of Scotland, Jesus Savior Pilot Me, Dixie, Old Folks At Home, Galilee, Eternity, Home Of The Soul, Jesus Is Calling, Light Of Life, Nearer My God To Thee, The Light Of The World, Remember Me, O Mighty One, The Bugle Song, Grace Be Unto You and Kitty McGee. The Whitney Brothers Quartet, who hailed from Rochester, New York, consisted of four sons: Alvin, Yale, Edwin and William Whitney. The sons of Methodist minister, James Edwin Whitney, Alvin sang first tenor, Edwin second tenor, William sang first bass and Yale second bass. Edwin would also give recitations that would more than please every crowd. According to one critic, It was rare to find in one family four gifted brothers, rarer to find four possessing the same gift, rarer yet to find four brothers with voices so attuned that they can assume the several parts in a quartet and rarest of all to find four whose esprit de corps, close sympathy and magnificent team work enable them to give a program of such beauty, harmony, balance and high appeal. The Whitney's compel laughter or tears and will, delight the ear, warm the heart, in an evening that is unique and artistic, Simply put, the Whitney's were irrestible and sure to please. I like how the critic also used the word, lollapoluzah, to describe the four brothers. The Whitney's stopped touring at the end of 1908. This historic record, Home of the Soul - which is a part of my 78 r.p.m. collection - celebrates its 103rd birthday next week. Rev. Andrew Jenkins was born in 1885, just outside Atlanta. He was left partially blind by a mis-prescribed medication while still an infant. Early on, he exhibited remarkable musical talents and was able to play by ear almost any instrument he picked up. Jenkins, who also showed a proficiency for writing songs, saw his musical abilities as a gift from God. Besides his musical talents, Andrew was skilled in other ways. At the age of nine, he began preaching to playmates from porches and tree stumps. He became a licensed Methodist preacher around the age of 21 and moved into the city, supplementing whatever he could earn from preaching and street performing by running a newspaper stand. After his first wife's death, Jenkins married Francis Eskew in 1919. A young widow, his new wife had three musically talented children; Irene, Mary Lee and a son, T.P. Thus, was born the Jenkins Family, which became one of the most popular family acts of its day and considered to be the first family act to record country music. In 1922, the Jenkins Family performed their first program on Atlanta radio station WSB, with Andrew Jenkins billed as "the blind newsboy evangelist." The station had a signal that reached coast-to-coast. 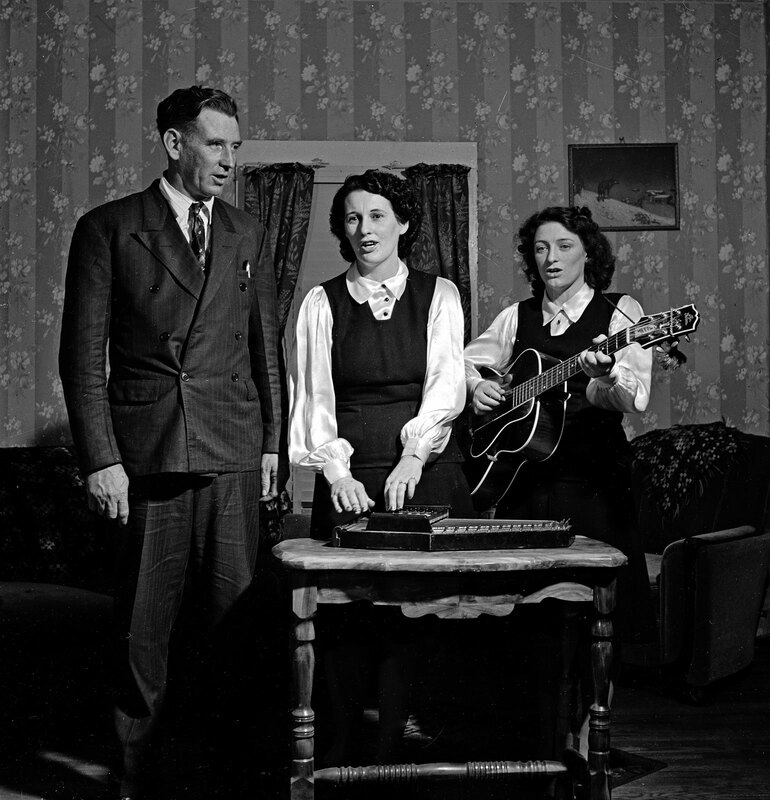 Performing folk, country and light classical material, the Jenkins Family was an immediate success and remained with the station for nearly a decade. 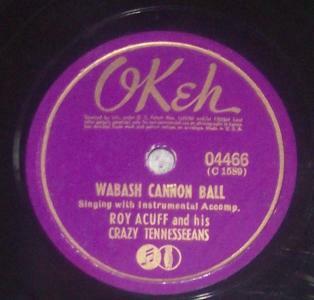 Their popularity, which reached to Canada and Mexico, also attracted the attention of the major record label, Okeh (pronounced OKAY) Records, for whom they made their debut recordings in 1924, three years before the Carter Family began recording. The Jenkins Family's initial releases were not originals, but were successful enough to earn the group another recording session, where they recorded four of Rev. Jenkins' songs, including two gospel numbers. Jenkins was soon asked to write songs for the label's other artists, and his first effort, "The Death of Floyd Collins," took just 45 minutes to complete. While the song sold poorly for Okeh, it was picked up by Columbia Records, which hired Vernon Dalhart, one of the era's leading singers, to record it. The Dalhart version eventually sold more than 300,000 copies. Besides being one of the all-time best-selling country music 78's, the song set a sales record for Columbia that stood for many years. Jenkins earned very little from the songs he wrote. The hit, "The Death of Floyd Collins," for example, brought him just $25, and under his agreement with the producer he was working with at Okeh, he also gave up all rights to the song. After experiencing copyright problems, Jenkins began keeping meticulous records of his songs. The practice eventually paid off. Years later, after Mahalia Jackson recorded one of his gospel songs, "God Put A Rainbow In The Sky," his step-daughter, Irene, was able to prove the song was not in the public domain but rather Jenkins' composition. Rev. Jenkins and the Jenkins Family continued to record with Okey into the mid-1930's under a variety of names, including The Jenkins Sacred Singers, Irene Spain Family, Gooby Jenkins and others. 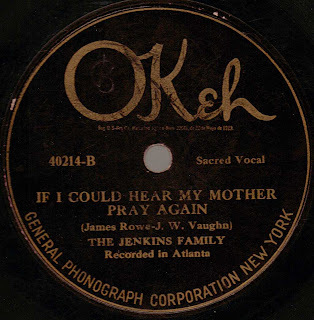 Jenkins cut his last record as Blind Andy, a name he often recorded under, on April 23, 1930, while the Jenkins Family's last recording session was Okeh was July 30, 1934. The Jenkins Family popularity opened Rev. 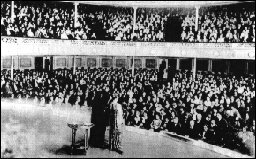 Jenkins' ministry to a wide audience, as they performed concerts and organized revival meetings throughout Georgia. Over time, Jenkins also served as pastor of several churches. In 1939, he lost his eyesight completely, yet he continued to preach up until the time of his death due to an automobile accident in 1957. Rev. Andrew Jenkins is credited with writing more than 800 songs. He was, without a doubt, among the most important composers of his time. I am proud to have several Jenkins Family records in my 78 r.p.m/ collection. The Binkley Brothers' Dixie Clodhoppers were an American old-time string band consisting of Amos Binkley on banjo, his brother Gale Binkley on fiddle, Tom Andrews on guitar, and Jack Jackson on guitar and vocals. The Binkley Brothers first performed on Nashville radio station WSM in 1926, and in 1928 became one of the first bands to record commercially in the city. The group performed regularly on the Grand Ole Opry until they disbanded in 1938. Amos and Gale Binkley were born in Ashland City, Tennessee, and were working as jewelry repairmen before they started playing for WSM. Andrews was from Franklin, Tennessee. The group was given the name "Binkley Brothers' Dixie Clodhoppers" by Opry founder George D. Hay, who preferred rural-sounding band names to fit the show's barn dance format. In September 1928, the group attempted to record several sides for Victor Records at the YMCA building in Nashville, but Victor's A&R agent Ralph Peer decided the group's vocals were too rough. Peer added Lebanon, Tennessee singer Jack Jackson to the line-up, and on October 2, the band made its first recordings. The group continued performing on the Opry throughout the following decade, and by the early 1930s Jackson— who was known as the "Strolling Yodeler"— was one of the most popular singers on Nashville-area radio. “The greatest shortcoming of the phonograph was its lack of Realism, and it is this shortcoming which I have sought to overcome. The result is a degree of Realism in our present phonograph which is baffling to even the most expert ears. On the first day of August in 1927, A.P. Carter persuaded his wife, Sara, and his sister-in-law (and Sara's cousin), Maybelle, to drive to Bristol, Tennessee and audition for Ralph Peer of Victor Records, who was scouting for talent. They recorded six tracks in two days ($50 for each song they recorded), including The Poor Orphan Child, The Wandering Boy, Single Girl Married Girl and The Storms Are On The Ocean, all of which are in my record collection. Immediately after that first recording session, Victor released a 78 r.p.m. record of The Carter Family performing Wandering Boy and Poor Orphan Child. A year later, another record was released with The Storms Are On The Ocean and Single Girl Married Girl. On May 27, 1928, the group traveled to the Victor Camden, New Jersey studios, where they recorded many of what would become legendary signature songs, including Keep On The Sunny Side, Can The Circle Be Unbroken and Wildwood Flower. A.P., Sara and Maybelle were all born and raised in southwestern Virginia, where they were immersed in the tight harmonies of mountain gospel music and shape note singing. Sara sang lead and Maybelle sang harmony and played guitar. On some songs, A.P. did not perform at all. At other times, he would sing harmony and occasionally, lead vocal. The Carter Family's music had a profound impact on folk, bluegrass, country, southern gospel, pop and rock musicians. But, the family's repertoire of songs wasn't the only thing important to music at the time. So was Maybelle's guitar playing. She would play the melody line on the lower strings with her thumb, while at the same time, maintaining the rhythm of the song by brushing her other fingers across the higher strings. By 1936, A.P. and Sara's marriage had dissolved. The group officially disbanded in 1944, although they continued to make records through 1956. Soon after the group disbanded, Maybelle began performing with her daughters; Helen, June and Anita, as the Carter Sisters and also the Carter Family. Maybelle became affectionately known as Mother Maybelle. Maybelle and Sara briefly reunited, recorded a reunion album and toured in the 1960's during the height of folk music's popularity. Today, The Carter Family is referred to as the First Family of Country Music. 1,500 music-lovers cannot tell the difference between living voice and its re-creation by the New Edison (Phonograph). Then came the 'dark scene' test in which the audience had to depend on ear alone. While Miss Morrisey was singing the lights went out. Densest black swallowed the stage, singer and phonograph. Morrisey's rich contralto continued to fill the auditorium. Then the lights flashed on again. The audience gasped - rubbed its eyes. Morrisey had left the stage. Only the phonograph was standing there. While the lights were out, the New Edison had taken up her song and no one in the audience had detected the substitution. The Los Angeles tone-test is not an isolated example. Approximately 4,000 similar tests have been given before 3,500,000 people in the United States and Canada. 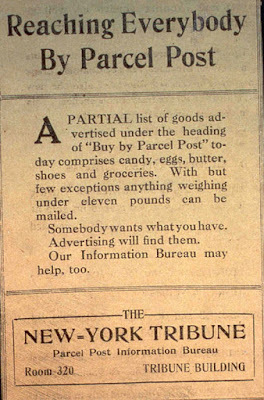 Representative newspapers have reported that these 4,000 tests were unqualified successes for the New Edison. 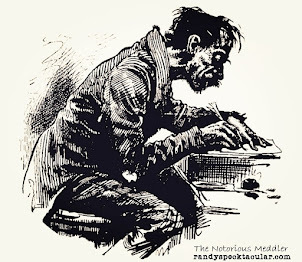 We do not believe there is any one who can listen, under proper test conditions, to a singer's voice (or instrumental performance), in comparison with the New Edison's re-creation and tell, with certainty, when he is listening to the (live performance) and when he is listening to the New Edison. We hereby assert, upon full information and belief, that the New Edison is positively, the only phonograph (or talking machine) capable of sustaining this test.